Outstanding location opposite bird island, superb view of the Pyla Dune. 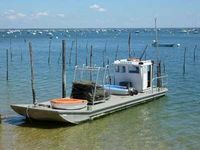 An authentic oyster farming setting in the listed village of Piraillan. Easy access by sea regardless of the tide's coefficient. A warm and original reception from the actual grower. Open all year round from 9am to 9pm. Sensory exploration of a wierd and wonderful universe, the oyster beds, farming methods and "au naturel" oyster tasting on the deck. Transmission of knowledge and passion guaranteed. Catering for groups and individuals. All year round from 9am to 9pm I welcome groups (of up to 100 persons) to my water edge shack. 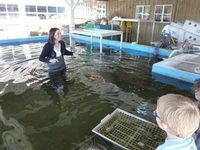 In an authentic oyster farming spirit and my farm based workshops I aim to give novices an insight into the pursuits and wealth of the Archachon bay. I also welcome connoisseurs to offer them a few hospitable and wholehearted moments, as well as top of the range products. Each activity is adapted to suit the visitor. Traditional "pinasse" (bay style) boat outings can be arranged from the shack. Take away : 5 €/dozen. Platter of shucked oysters on ice (Pre-booking required) : 6 €/dozen. Home delivery and hot and cold buffet catering to suit all appetites. Call for an estimate on 05 56 60 54 76 or write to me. Oyster tasting on the deck. Come and discover the different oyster flavours that change with the seasons. Available all year round. Product tasting on the deck or in the farmer's shack, or, for those of you who want to relax on the water front, tasting with wine, lemon , bread and butter, you can also follow a local custom and include some "paté". And depending on supply you can top up with whelks, shrimps and clams. This shucking workshop is for the nervous and the inept, whose oyster eating has been restricted due to opening problems. Followed by the tasting of 6 of your oysters, all of different sizes and geometrical shapes..
An enjoyable and fun way to learn a skill that is an integral part of our local culture. Two summer sessions are scheduled at 10am on Tuesdays and Thursdays. Everybody welcome. 9 € per person. Introduction and/or conversion to the oyster : For the non-believers and the averted who don't realize what you are missing! First time oyster tasting served with a glass of wine, lemon, bread and butter and a step by step guide . It's great fun! Firstimers can at long last, enjoy tackling an oyster : 100% success rate for 7.50 Euros per person. Exhibits/Land production site visits (in French and English) : To gain a better understanding of our profession. 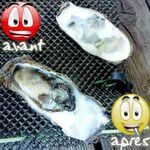 Presentation of the Arcachon bay, oyster biology and farming. Less than 8 persons : A fixed rate of 30 €. More than 8 persons : 5 € per person.